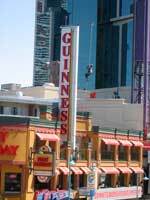 Guinness World Records Museum is located a block from Casino Niagara. Discover the tallest, shortest, heaviest, fastest, loudest and richest. Check out 'The Kugel', a 10,000 lb. granite ball that you can turn with one hand as it floats on water. There are thousands of amazing facts and feats in the popular museum that brings the television show and the world famous Guinness Book of Records to life. They do it with video, computers, inter-active games, life sized models and props. Get you picture taken with the world's fattest or tallest man.